And the winner is...Kathleen (comment 44)! 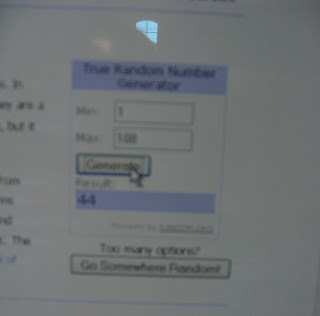 I've attached a pic of the winning number that came up on Random.org, just in case anyone wonders how I came up with it. Congrats Kathleen! I hope your hamster serves you well. Thanks so much to everyone who commented - I loved hearing all the interesting, healthy foods everyone's been eating...lots of great ideas and there are some things I definitely want to try. Anyway, after learning about the Zhu Zhu Pets, I snagged a few of the little hamsters at Toys R Us while I was there shopping for a birthday gift. At that time, a mere 6-7 weeks ago, you could actually wander into a Toys R Us at a normal time of day and buy a Zhu Zhu Pet without having to bribe or trample anyone. I know...crazy, right? As Christmas nears and my daughters still don't give a hoot about whether or not they own a Zhu Zhu pet, I've found myself in a quandry about what to do with the three I possess. Do I give them to the girls anyway, since they are pretty darn cute and they'd probably enjoy playing with them? Do I sell them on ebay or craigslist at a 400% mark-up? Do I donate them to some charity for disadvantaged kids? I decided that I will give two of them to the girls, and give the third away on my blog. It might not be the world's most charitable act, but hopefully it will mean one less parent having to wait in line at a ridiculous time of night or beat down some poor old lady just to make their kids happy on Christmas morning. Post a comment below briefly describing the most delicious nutritious food you've eaten recently. It can be something as simple as a crunchy Fuji apple, or as complex as a side dish of steamed, marinated haricot verts at some fancy-shmancy restaurant. Be sure to include your email address, or if you're uncomfortable posting your email address, include your first name, last initial, City & State (ie: Alicia M. Salt Lake City, UT) in the comment. I will be either emailing the winner or posting the winner's name (if no email is included) next Saturday, 12/5 at 8:00 am Arizona time (I think it's Mountain?? Not sure because we don't do daylight savings). Next Saturday morning, I will go to Random.org and have a random number chosen to select the winner. And I promise the winner will receive his/her Zhu Zhu pet in time for Christmas! hmmm. Most nutritious? I had salad for lunch, but I put lots of dressing (Golden Italian) so that might negate the nutritiousness of it! the healthiest food i've eaten? a fluffy egg white omelette with mushrooms, spinach, broccoli and low fat cheese. it was lunch today!! my son is dying for this toy! and it's sold out everywhere. except places where they inflate prices, like amazon!! I know a little girl who might appreciate it. Nutritious food that I've eaten recently, though . . .hmmmm. This shouldn't be that hard. Um, I had some spinach! It was inside a roll coated in butter, but still. Spinach. That totally counts. Hmmmmm.... I had a steak & baked potato. This may not sound so healthy,but I am also Celiac positive so meat and potatos is good for me. I also subscribed to you on my google reader! I would have to say one of the healthiest things I have eaten lately was an apple, fennel and jicama salad with port vinegar, poppy seed and honey dressing. My husband made it as a side for Thanksgiving and it was SO good! A nice alternative, very bright and fresh in your mouth. I love that the hamster's name is chunk!! you are in my reader. officially. For breakfast I sometimes like just an scrmbled egg whites with some spices on a piece of rye toast. I also had oranges and herbal tea. mmm... I've been making soup lately, and my favorite is a Chipotle Navy Bean, from Cynthia Lair's 'Feeding The Whole Family', I think. Super simple, vegetarian, freezes like a charm and it's only the navy beans (soaked), an onion, a tablespoon of EVOO (sorry) and cooked with pre-soaked chipotle peppers, which you take out, then you can blend the soup (which I do) to make it creamy... grab some rye bread and a salad and holy makral you won't even know it's all good for you! now i'm hungry...! Also you're in my feed reader now. Wow, what a great giveaway! This one will get big no doubt. The most delicious nutritious thing I ate recently was probably the kale chips I had last night. We love them. Or perhaps the spaghetti squash "alfredo" with supper, since it is quite good for you and it certainly delicious!! High in calories but the right kind. Or my homemade cottage cheese. I made a batch for the first time this week and it was sooooo good. I really really hope I win this because it would make my kids so so happy. Either way I am happy to have discovered your blog. It looks like I will like it. I've struggled with eating horribly all my life, and I'm trying to make some major changes. I've learned SO much this past year or so. I made sure to have roasted red potatoes with rosemary and garlic instead of mashed potatoes on Thanksgiving! And they were delicious!! Also? I've added you to my google reader! Sign me up for two entries! Also, I subscribed to your blog for a bonus entry. I would say the special gourmet cheeses my mom had for snacks at Thanksgiving. Hey Lyss! I'm not entering the contest....but just wanted to say that you are awesome & showing the true spirit of Christmas!! Love ya! I saw this through Adam and thought I'd give it a shot. We made kale chips last week. We also made green bean casserole with Imagine dairy free mushroom soup with a touch of xantham gum to thicken it for our dairy allergic daughters. I subscribed to your feed. It's always nice to get new dairy-free recipes. We had beans & rice for dinner! Yummy & nutritious! Also? I just recently learned what haricot verts are, so I cracked up when I saw that here! =) Thanks for the chance to enter. You should totally sell the other two on ebay. It will probably pay for your Christmas. Crazy people! I have been trying to eat healthier lately. Yesterday I had an avocado sprinkled with lime juice and coarse kosher salt, soooo good. I had some cooked spinach the other day with garlic, sea salt and crushed red pepper. I ended up eating it right out of the pan. I would have to go with a simple, delicious banana. Thanks. a grape right off the vine. Kale from our garden (it's amazing how long that stuff lasts- through several frosts at this point) sauteed with garlic and onion. Mmmm. Please pick me! Love your site. Over the summer, I enjoyed garden tomatoes cut up with basil and fresh mozzarella and a little Italian dressing drizzled on top. Yum! I ate fresh green beans with my own special blend of spices! I have recently enjoyed Gala apples... yum! I just ate some sweet, delicious black grapes. Better than candy. OMG I ate the most delicious omelette at Mimi's Cafe this past Sunday. It had fresh basil, feta cheese and tomatoes. By far the best omelette I've had in my life. The most delicious food would be eggs and cheese. I had the best apple bread the other day that had no sugar added!!!! Because of my health, I have to eat things without sugar. I have not found much I like (I live for sugar!!!) but this was really good, and good for you!!! Hope I win. My son loves these!!! The most nutritious thing I ate recently was a spinach salad on Thanksgiving Day. It had a little bit of bacon crumbled into it, but that was it. Also a light oil-based dressing. YUM! Fresh raisins from the farmer's market. They were huge, and juicy, ans super sweet, not dried up little husks, like those supermarket raisins. I've been hiding them from my kids. Fresh Mandarin Oranges purchased in Placer County, California! Sooo yummy, I miss living near them but we were visiting this weekend and bought a while field lug on the way home! I just had Kashi Strawberry Fields with 1% organic milk for LUNCH. Yes, lunch. I love cereal for lunch. A big, ginormous bowl of it. At Thanksgiving I had some organic spinach salad with toasted almonds and dried cranberries. Very yummy. I had a turkey wrap for lunch. best nutritious food...a fabulous chicken salad from a little cafe in town. My favorite healthy snack is sliced red pepper and hummus! YUM! It's easy to find good food; the hard part is finding HEALTHY good food! Recently, I discovered this healthful dish from my local grocery store - Wegmans. It is "Butternut squash with Spinach" . You can find the recipe at www.wegmans.com. I had fresh fruit crepes topped with yogurt and granola. Mmmm! My yummy salad last night was spinach with cranberries and feta cheese. A balsamic vinegar dressing topped it off! YUM! The most delicous nutritous item I have eaten lately is a fresh pear from my neighbor's tree! Eagerly searching for a ZhuZhu pet for my daughter!! I have a long commute and a hard time remembering to eat my veggies so every night on my drive home I eat a big dish of spinach and cherry tomatoes, sometimes with bell peppers or celery. I follow that up with an apple. I get several servings of fruits and veggies and I'm not starving when I get home. Works great! Thanks for the giveaway! Recent nutritious food would have to be green beans. I love them and so do my kids! I just ate a wonderful hot bowl of Oatmeal with apple slices this morning!! SO good on this cold day! Spinach salad with celery, carrots, sunflower seed, broccoli and a bit of balsalmic vinegar. Delish!! Celery stick....mmmmmmmm. Love it, and a superfood! My son had had organic gala apples and low fat string cheese for lunch and of course I had to clean the plate! I am following your blog via Blogger! I am now a follower!! Yeah!! here is a link to my blog post!!! thanks for the chance! Fresh spinach sauteed in olive oil and a little butter. The healthiest thing I've eaten today is a chocolate covered pretzel! Seriously....pathetic I know but I'm a bit of a junk food nut! :) I'll do better tomorrow! Felt I should also become a follower! We love snacking on fresh peas!! I would have to see steamed asparagus with sea salt and ground pepper with a squeeze of lemon. Yum! I think it's hilarious that your child just doesn't want santa to come in your house! The healthiest thing i've been snacking on lately is steamed edamame with sea salt- addictive! I had the most DELICIOUS banana today. I just had a fresh orange I picked off my mother in laws tree. Nothing is better than fresh fruit. We are all about healthy at our house. I'm going to say the banana I had with breakfast, but I have to add my daughter's favorite too. She LOVES "brocka" (broccoli). Mmmm. A slightly tart Honey Crisp apple. Yum! definitly the kashi heart to heart i had for breakfast! Right now my family and I have been enjoying steamed asperagus at least once, if not twice a week! Delicious! Hmmm... I had a smoothie for breakfast this morning - Strawberries, bananas, protein powder, and milk. Yum! I had the best carrot sticks today! They were perfect! Definitely the turkey noodle soup I made completely from scratch from Thanksgiving leftovers. It was so, so good, and full of veggies and everything homemade! I just ate an apple, not sure what kind, but it was delicious. I ate some steamed carrots last night. I had a snack of organic baby carrots and hummus! YUMMM. We make a great, low-fat, low-salt (but still delicious) chicken tortilla soup, which I just love. I've also recently discovered honeycrisp apples. Yum! Thanks for the giveaway -- my son would love this! I had steamed cabbage last night, 13 minutes in the microwave covered w/plastic wrap & add about 1/2 cup water & a Tablespoon of butter. Yum! I ate homemade apple chips. YUM! Bulgar with carrots and garlic. And no, it is not vulgar! I had a Cajun Tilapia meal from BistroMD! i had a seaweed with geoduck soup. it was delish! I just had a peach. It wasn't very good but I love fresh fruit. It tasted like a peach but it was hard like an apple. Grilled salmon and a side of steamed broccoli :)! The omega-3s in salmon provide great brain fuel! P.S. I really hope I win this Zhu Zhu pet because I want to give it away to a child at a homeless shelter I volunteer at who might not otherwise get a Christmas gift this year. i've subscribed to your blog.